The fact that most parts of the country are inhabited and largely accessible opens up a myriad of possibilities for fishing adventures in Norway, both for freshwater and deep sea fishing. Inland, for example in Hemsedal and Gjøvik, you will find some of the finest spots for freshwater fishing in general and fly fishing in particular. Thousands of lakes, rivers and streams are waiting to be explored for wild trout, salmon, grayling, pike, powan and arctic char, to name a few common species. Or you can head to the wild, rugged and largely unspoilt coastline for great chances to get your dream catch on the hook. Thanks to the cold and clear waters and a strong focus on sustainability, the Norwegian seas have abundant stocks of many fish and shellfish. The ocean is literally brimming with a variety of big ones like cod, haddock, plaice, pollack, redfish, ling, tusk, halibut, mackerel and saithe. The length of Norway’s coastline is an impressive 101,388 kilometres, which would circle the world two and a half times if stretched out, according to National Geographic. That isn’t merely a fun fact – rather, it explains why the sea has been the very basis of existence for the people of Norway. Even though fishing today has developed into a large, modern industry, angling is still important to the Norwegian lifestyle and as a pastime. ”Norway - where cod is god”, as The Guardian wrote, somewhat jokingly. 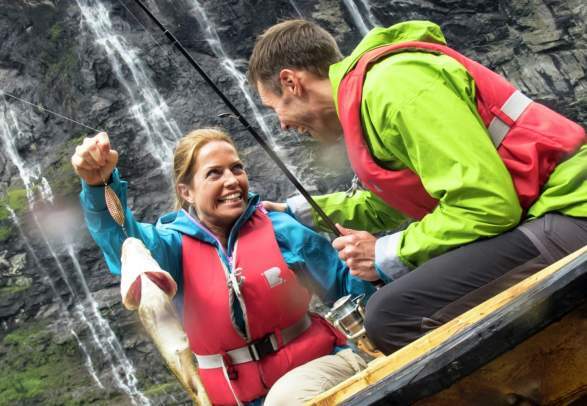 So if you want an authentic outdoors experience in Norway, plan a fishing holiday. Visit during the summer season and try your luck around the clock under the midnight sun, or brave the winter cold to take part in the famous skrei (migrating cod) fishing or ice fishing under the northern lights. Fish tend to get bigger in cold water, which is why a winter adventure may be exactly what you are looking for. The fact that most parts of the country are inhabited and largely accessible opens up a myriad of possibilities for fishing adventures in Norway, both for freshwater and deep sea fishing. Inland, for example in Hemsedal and Gjøvik, you will find some of the finest spots for freshwater fishing in general and fly-fishing in particular. Thousands of lakes, rivers and streams are waiting to be explored for wild trout, salmon, grayling, pike, powan and arctic char, to name a few common species. Or you can head to the wild, rugged and largely unspoiled coastline for great chances to get your dream catch on the hook. Thanks to the cold and clear waters and a strong focus on sustainability, the Norwegian seas have abundant stocks of many fish and shellfish. The length of Norway’s coastline is an impressive 62,999 miles, which would circle the world two and a half times if stretched out, according to National Geographic. That isn’t merely a fun fact – rather, it explains why the sea has been the very basis of existence for the people of Norway. Even though fishing today has developed into a large, modern industry, angling is still important to the Norwegian lifestyle and as a pastime. So if you want an authentic outdoors experience in Norway, plan a fishing vacation. Visit during the summer high season and try your luck around the clock under the midnight sun, or brave the winter cold to take part in the famous skrei (migrating cod) fishing or ice fishing under the northern lights. Fish tend to get bigger in cold water, which is why winter adventure may be exactly what you are looking for. Whether you are already hooked on fly fishing or looking forward to casting your first nymph in the river, Hemsedal in Eastern Norway is a worthy destination. Fish for trout of the highest calibre in Hardangervidda. Uvdal and Hol make good bases for fishing adventures in Norway’s largest national park.